Explain the relationship between pressure and force. Calculate force given pressure and area. where is a force applied to an area that is perpendicular to the force. Pounds per square inch is still sometimes used as a measure of tire pressure, and millimeters of mercury (mm Hg) is still often used in the measurement of blood pressure. Pressure is defined for all states of matter but is particularly important when discussing fluids. Figure 1. (a) While the person being poked with the finger might be irritated, the force has little lasting effect. (b) In contrast, the same force applied to an area the size of the sharp end of a needle is great enough to break the skin. Example 1: Calculating Force Exerted by the Air: What Force Does a Pressure Exert? An astronaut is working outside the International Space Station where the atmospheric pressure is essentially zero. The pressure gauge on her air tank reads What force does the air inside the tank exert on the flat end of the cylindrical tank, a disk 0.150 m in diameter? We can find the force exerted from the definition of pressure given in provided we can find the area acted upon. Wow! No wonder the tank must be strong. Since we found we see that the force exerted by a pressure is directly proportional to the area acted upon as well as the pressure itself. Figure 2. 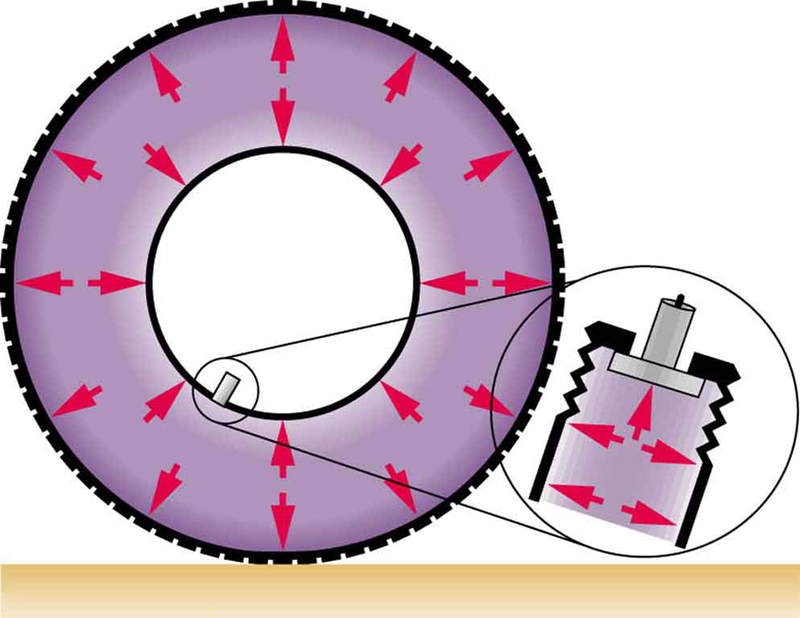 Pressure inside this tire exerts forces perpendicular to all surfaces it contacts. The arrows give representative directions and magnitudes of the forces exerted at various points. Note that static fluids do not exert shearing forces. Figure 3. Pressure is exerted on all sides of this swimmer, since the water would flow into the space he occupies if he were not there. The arrows represent the directions and magnitudes of the forces exerted at various points on the swimmer. Note that the forces are larger underneath, due to greater depth, giving a net upward or buoyant force that is balanced by the weight of the swimmer. 1: How is pressure related to the sharpness of a knife and its ability to cut? 2: Why does a dull hypodermic needle hurt more than a sharp one? 4: Why is force exerted by static fluids always perpendicular to a surface? 5: In a remote location near the North Pole, an iceberg floats in a lake. Next to the lake (assume it is not frozen) sits a comparably sized glacier sitting on land. If both chunks of ice should melt due to rising global temperatures (and the melted ice all goes into the lake), which ice chunk would give the greatest increase in the level of the lake water, if any? 6: How do jogging on soft ground and wearing padded shoes reduce the pressures to which the feet and legs are subjected? 7: Toe dancing (as in ballet) is much harder on toes than normal dancing or walking. Explain in terms of pressure. 8: How do you convert pressure units like millimeters of mercury, centimeters of water, and inches of mercury into units like newtons per meter squared without resorting to a table of pressure conversion factors? 11.3 Pressure by OpenStax is licensed under a Creative Commons Attribution 4.0 International License, except where otherwise noted.